The thumbnails below link to their corresponding, good-resolution 11x17 PDFs. 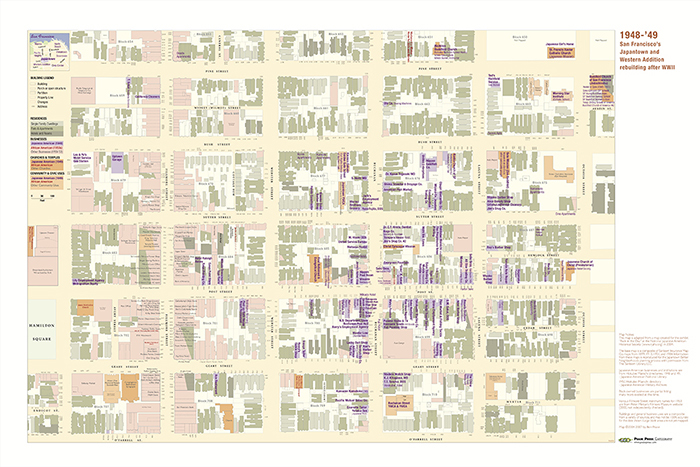 Each map is a snap-shot of a particular date, often just before a big transition. 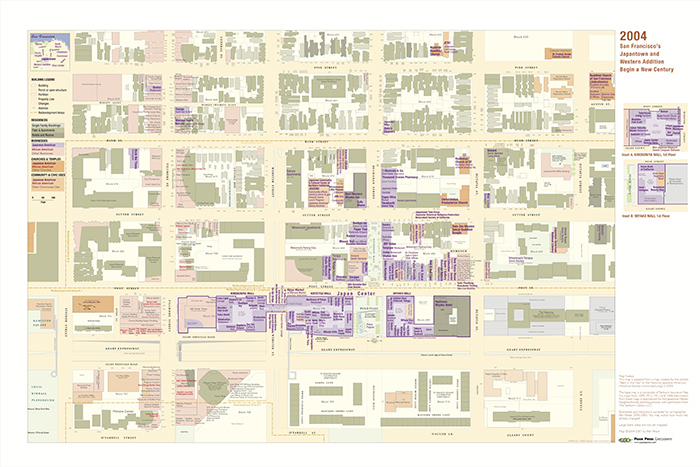 (Were we to map Japantown in mid-1942, there would be no Japantown to speak of. Ignoring older institutions such as the Madame CJ Waker Houses, we would miss the African American settlement that swelled in WWII and into the 1950s, but was displaced in the late 1950s by A-1 and A-2 projects. 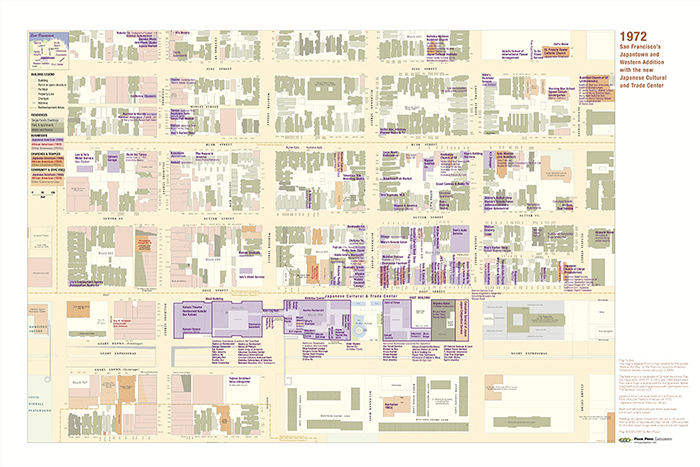 A map in 1960-61 would show Japan Center and Geary Expressway as a big vacant lot or a hole in the ground. 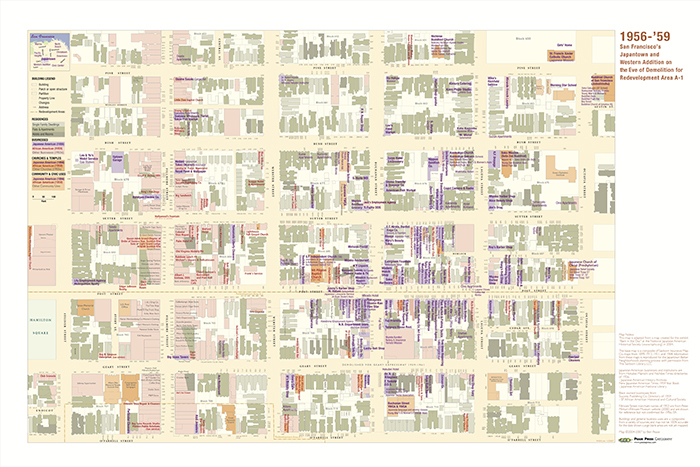 The A-2 project which affected the blocks between Bush and Post in the 1970s, was just starting in 1972; the 2004 map is too big a gap to show the early businesses in these blocks (including small shops and big gathering spots such as Japantown Bowl). In 1940 the center of the Japanese American business district was at the intersection of Post and Buchanan Streets (as it is in 2018). Seemingly, every business within a block of this corner was Nikkei-run. But the Nikkei presence extended some distance in all directions – the Buddhist Temple and Catholic Church were off to the northeast (upper left), and there was a scattering of businesses on upper Fillmore (and several more a block farther north, off the map). There are additional Japanese institutions beyond the map, such as Pine United Methodist Church (several blocks east on Pine Street near Polk and Larkin; today out in the Richmond District). The largest Christian congregation, the Reformed and Evangelical Church (now merged with United Church of Christ) was located on Post Street in a big, old Congregational Church. This church was larger by far than most other rooms, and was used by other groups for large community events. The Community Hall next door (built in 1924) later became the Hokubei Maininchi Newspaper building (scheduled to be demolished late 2007). The Soto Zen temple took over the former Ohabai Shalome Synagogue just a few years earlier (1934); today this has been restored as Kokoro Assisted Living Facility. As we've mentioned, in 1940 there was still a sizeable commercial district on lower Grant Ave. between Sacramento and Bush Street. There were still numerous trading companies between Chinatown and the Embarcadero (the area later redeveloped as Golden Gateway). The once-thriving enclave in South Park had by 1940 faded into the woodwork due to immigration restrictions and the Japanese shipping lines moving to the North Embarcadero. (The Bochow Hotel on Buchanan may be a South Park hotel which relocated back to Japantown in the '30s). There is quite a bit of history in the post-WWII maps, which I made for NJAHS's "Back in the Day" exhibit (and restyled the 1940 map to match). All I'll say for now is that there have been various comparisons of 1940 and 1950 (I've done it myself, using earlier maps from the Japantown Arts and Media Workshop). In 1950, Japantown is still a shadow of its prewar self. In 1948-49 it's even smaller, but growing; there are businesses far off in the boonies (because that's where space was available). 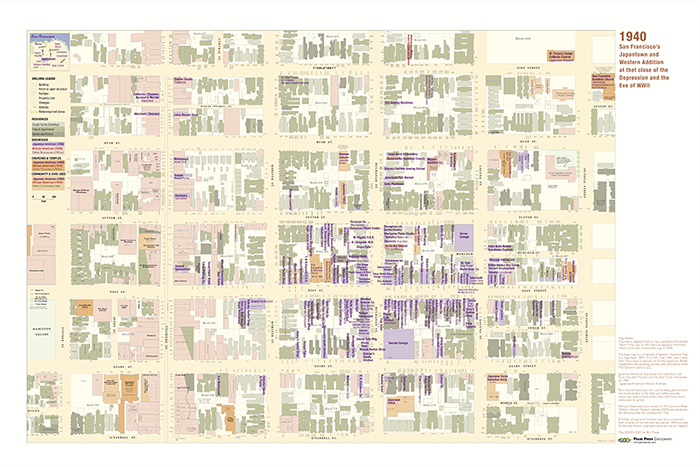 By 1957-59, the businesses had grown considerably healthier than in 1950 and had coalesced at the original corner (now intermingled with African American businesses and clubs). But it was an uneasy time with Redevelopment planners looking for signs of blight, and it was not to last in this form for long. If you compare 1972 to 2004, there is quite a bit of change in Japan Center; almost as much as you'd see comparing 2004 to 2018. These maps later appeared in the City Planning Department's Better Neighborhood Project document, created in conjunction with the Japantown Task Force.